This modern outdoor concrete fire pit can be built over a single weekend and is a great centerpiece for outdoor entertaining. 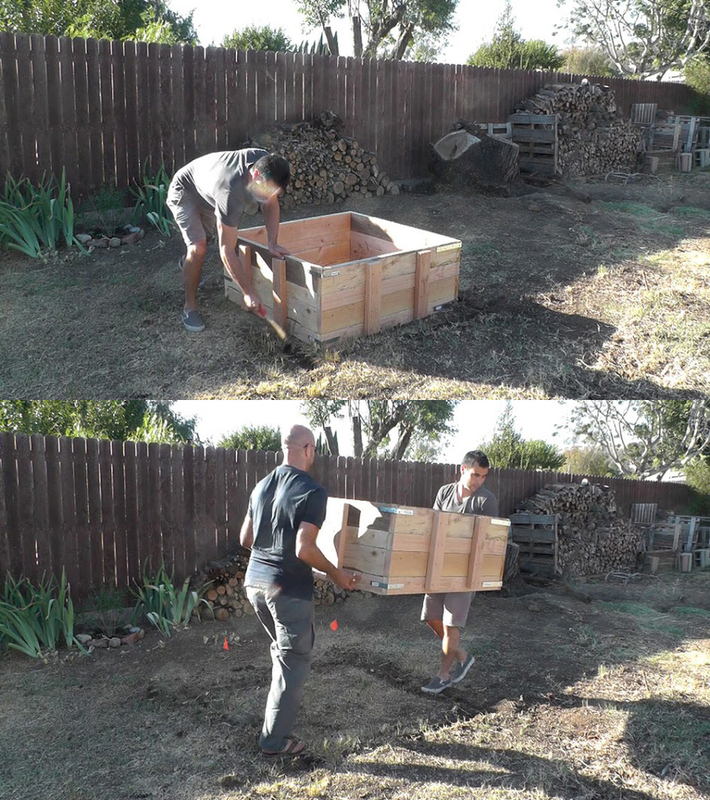 This is not a difficult project but is time consuming and labor intensive. 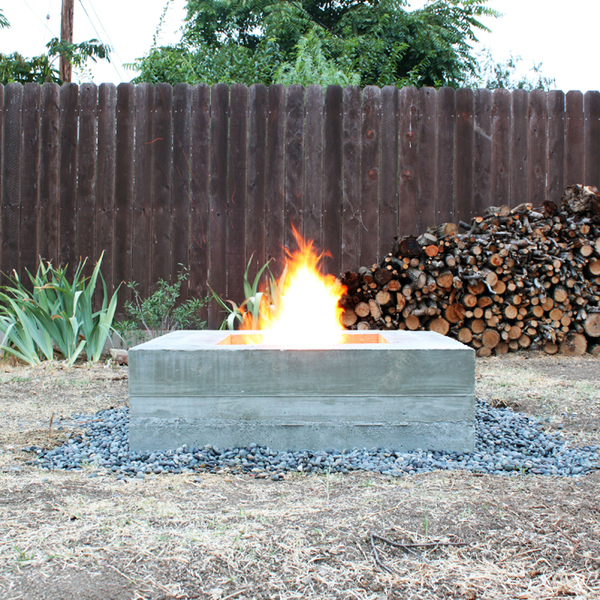 Concrete fireplaces and fire pits should be constructed carefully. 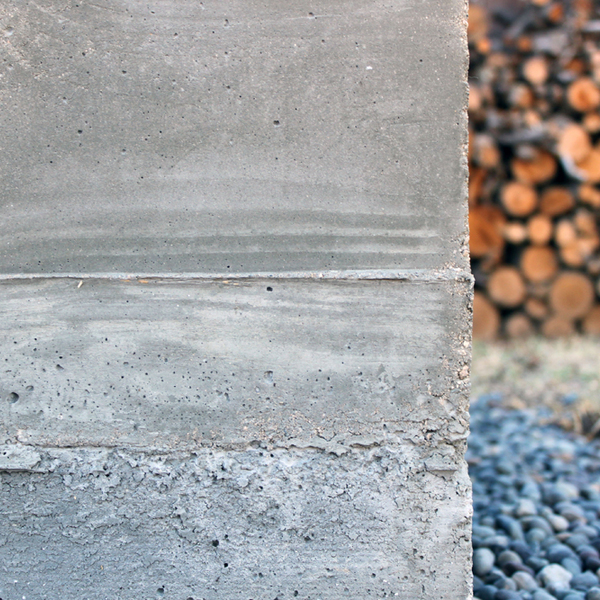 When exposed directly to high amounts of heat the moisture trapped inside concrete can expand, causing the concrete to crack and in extreme situations explode. 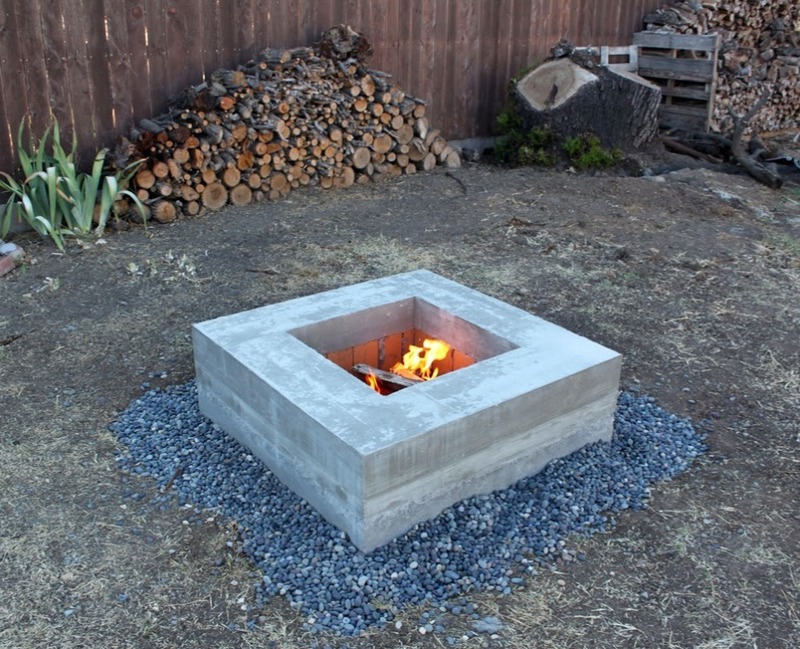 I lined the inside of the fire pit with fire brick and filled the bottom with lava rock to ensure that the majority of the heat from the fireplace is not coming in direct contact with the concrete. 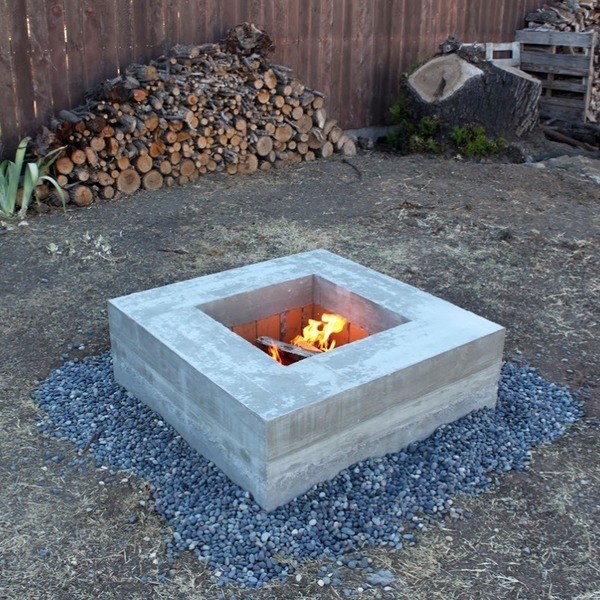 I built this fire pit in southern California so I didn’t have to worry about putting in footings that go below the frost line. 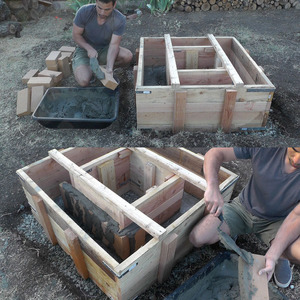 If you are building this pit in a cold climate, I would recommend putting a sonotube footing under each of the four corners. Make the inner frame. 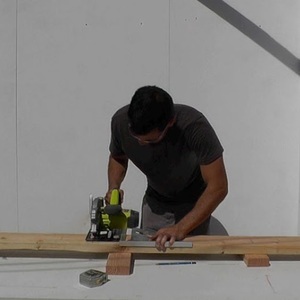 The inner frame is made from 2 panels that are 23” long and 2 panels that are 20” long. 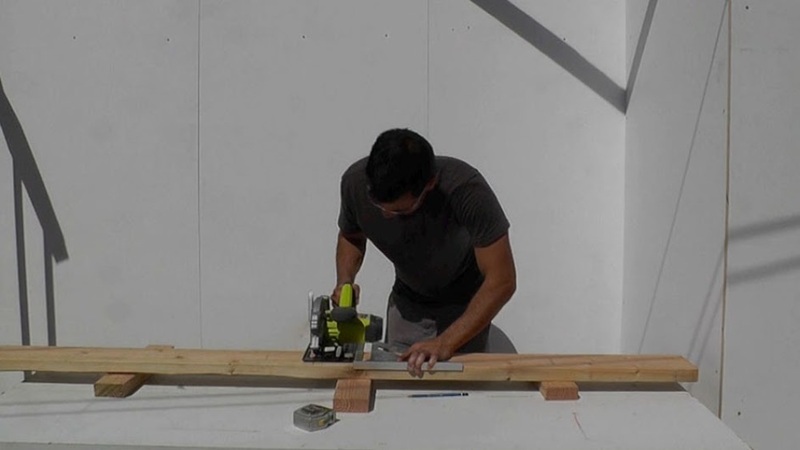 Make sure to put the L-brackets on the inside corners of the frame since the outside ones will be buried in concrete. Place the frame and mark the hole. 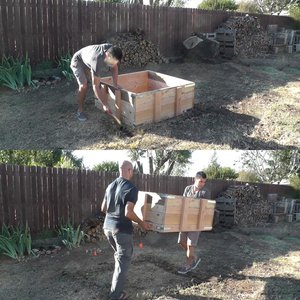 Place the frame in the desired location and mark about 6inches around the outside perimeter. 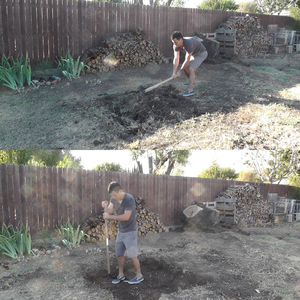 Start digging. Since I am built this fireplace in southern California I didn’t have to worry about putting in footing below the frost line. 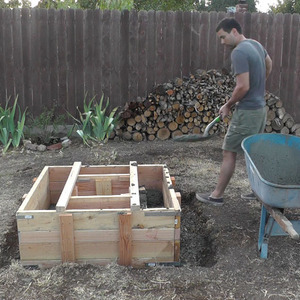 If you are building in a cold climate I recommend putting in footings that go beneath the frost line under each corner. 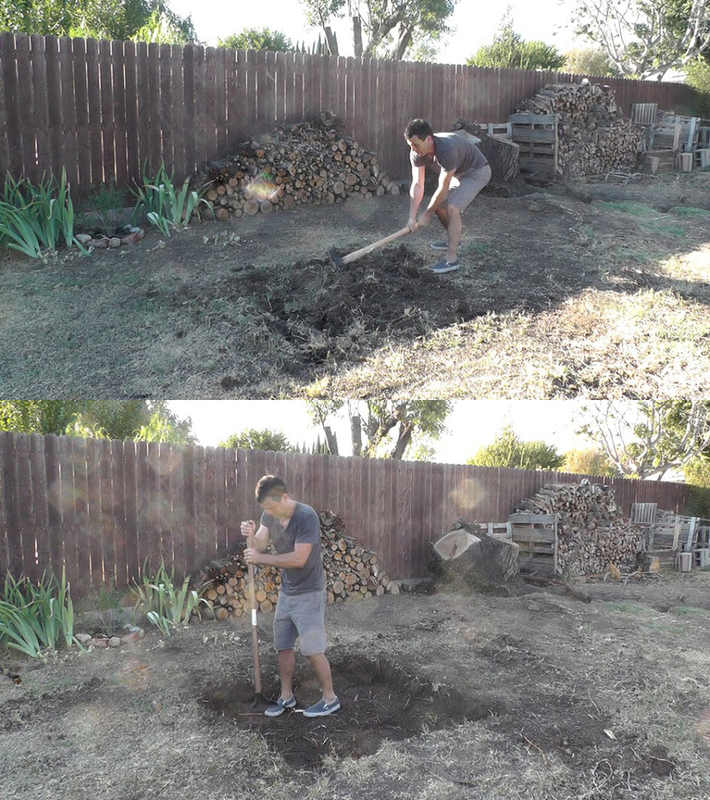 I dug about 8 inches down. 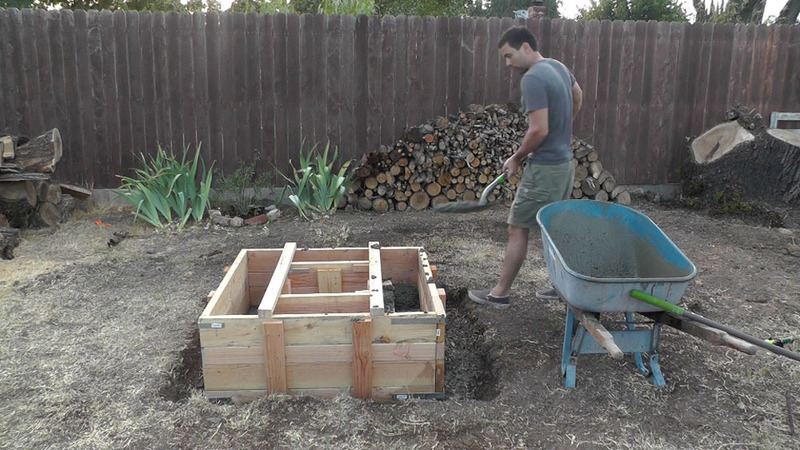 I used a stamper to flatten and compact the soil at the bottom of the hole. Spread some gravel. 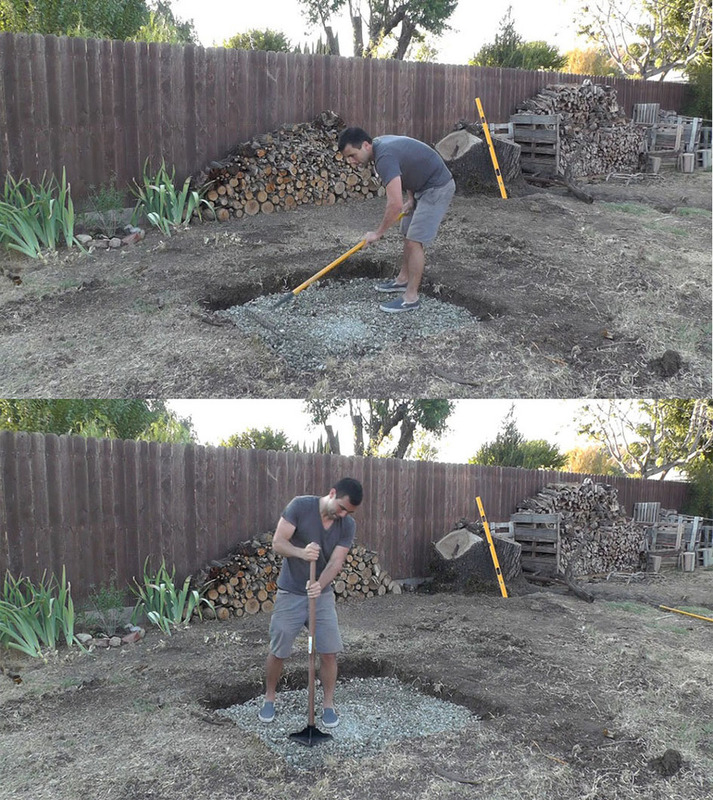 I spread about 3.5” of Quikrete ¾” gravel in the bottom of the hole and raked it as level as possible before stamping it down. 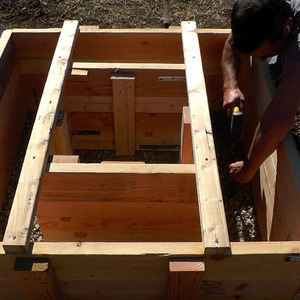 Place the formwork. I placed the frames into position and measured the distance between the inner frame and outer frame to make sure the inner frame is properly centered. 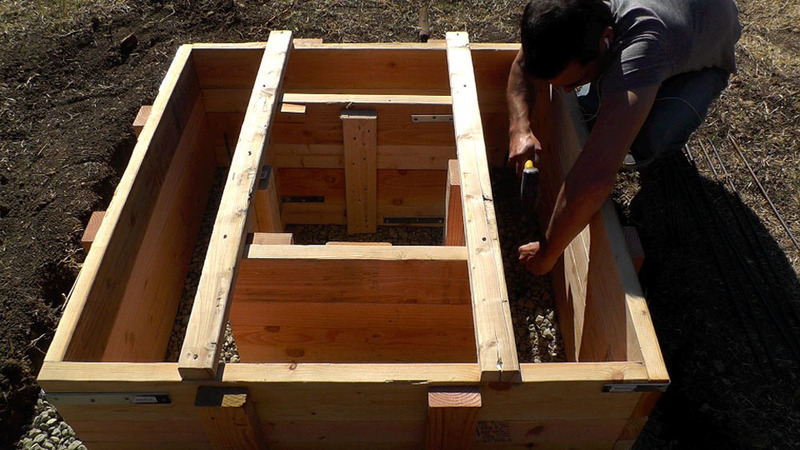 Secure and level the formwork. Once the frames are in the right position I used some scrap 2x3s to and deck screws to lock them into place. 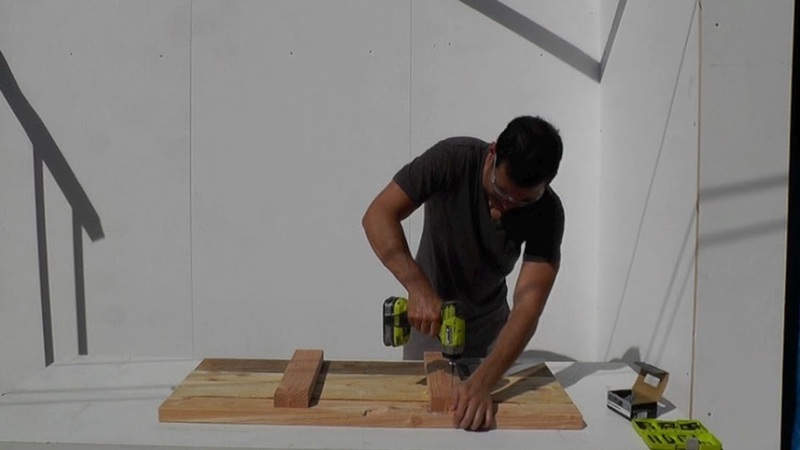 I then used a 6 foot level to make sure that the formwork was level. I used a rubber mallet to knock down the high corners to make it more level. Place the Rebar. I drove the rebar through the gravel and into the ground. I should have used longer rebar instead of the short 12” long vertical pieces. 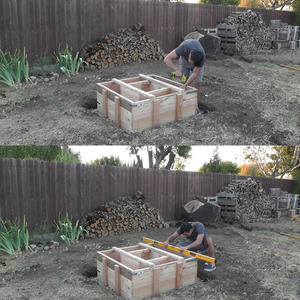 I then wired 3’ long pieces horizontally about 2” from the bottom of the hole. 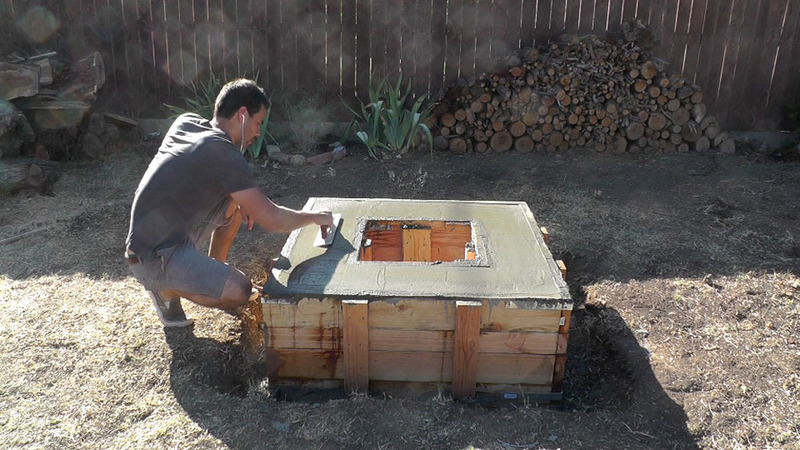 Pour the first layer of concrete. 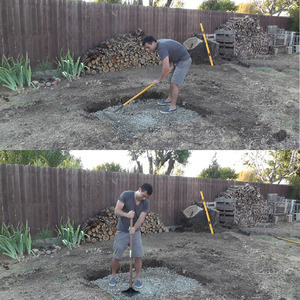 I started with a 3.5” deep pour of concrete that would serve as the foundation of the fire pit. 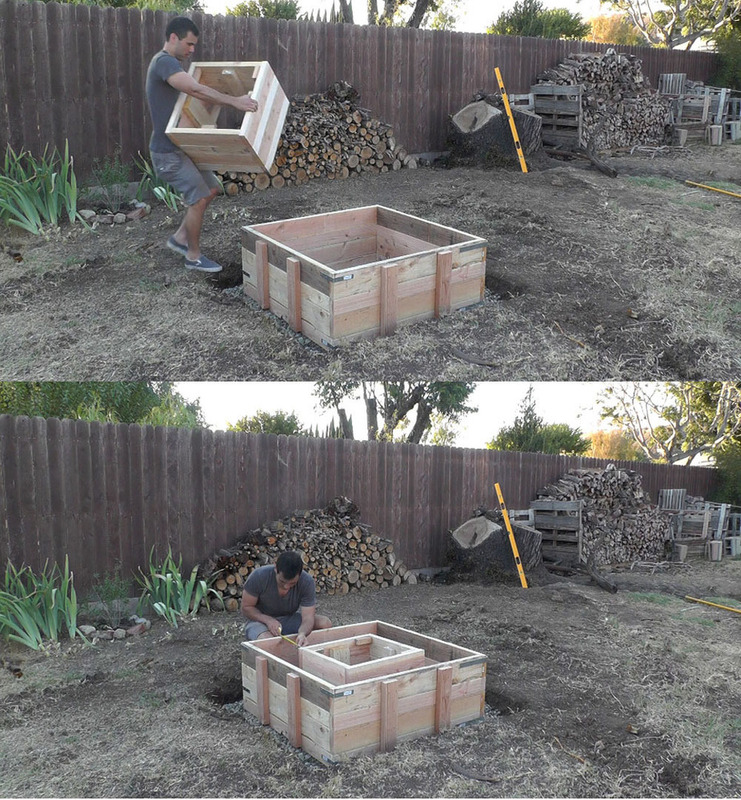 I mixed the Quikrete 5000 in a wheelbarrow and shoveled it into place. Renting a mixer would have made this a lot easier but I enjoyed the exercise. 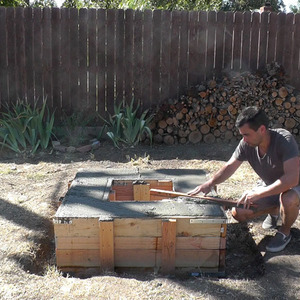 Let the concrete cure at least 20 hours before laying the brick. Lay the brick. 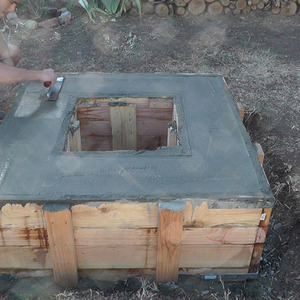 Once the concrete has cured at least 20 hours get ready to lay the fire brick. 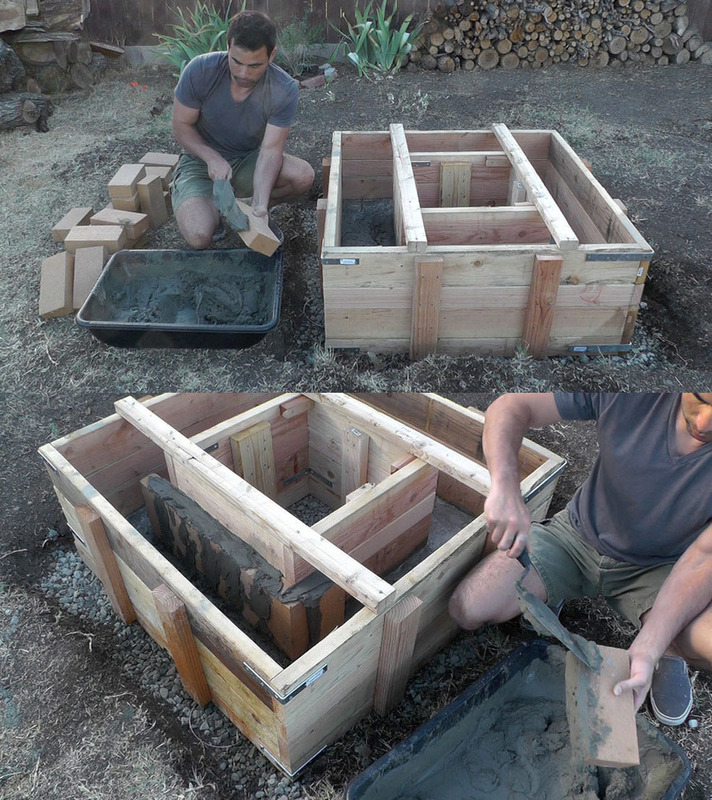 I mixed the mortar per the instruction on the bag of mortar clay. 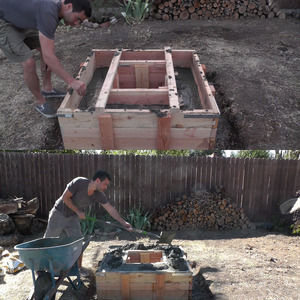 I started with a thick base of mortar about ½” around the inner perimeter of the formwork I then placed the bricks one at a time. I spread mortar on the side of the bricks before place them so that they would stick together. 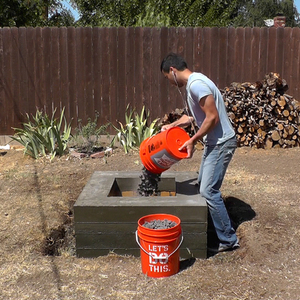 Pour more concrete. 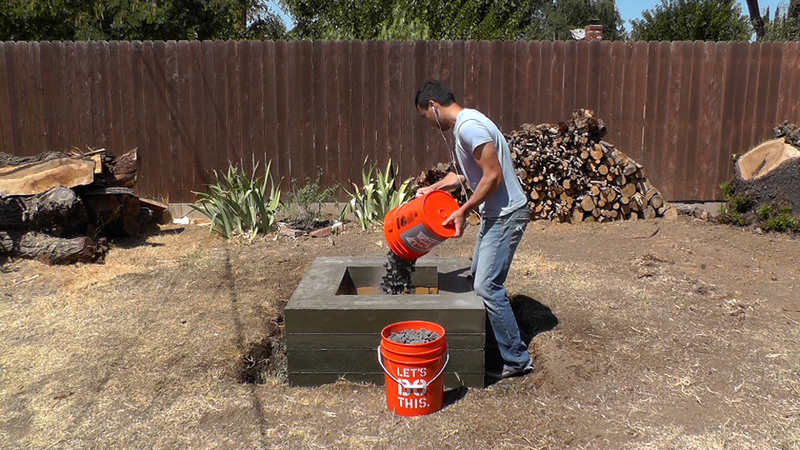 Once the mortar set I mixed and poured another 5”s of concrete. I could have poured it all at once but mixing concrete by hand is exhausting and by doing it this way I can remove any extra braces that could be in the way of screeding before doing a final pour. I also added in additional rebar since my 12” bars where already covered and wanted to make sure that the layers of concrete where bonded together. Pour the final layer. 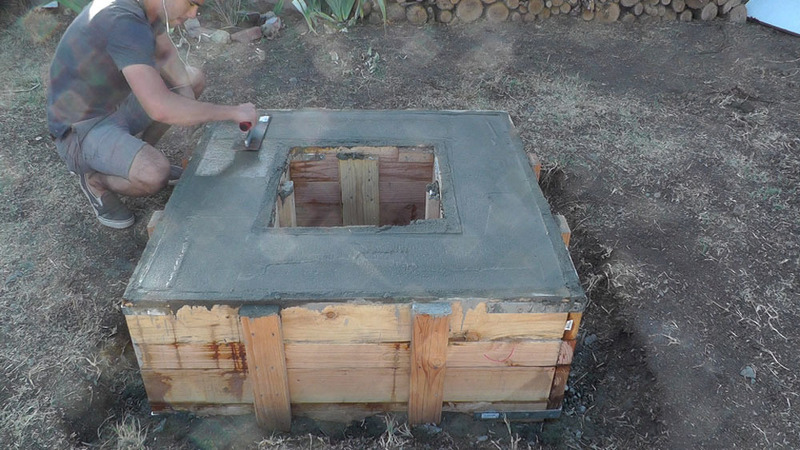 After letting the previous layer of concrete cure about 20 hours I poured the final layer of concrete. 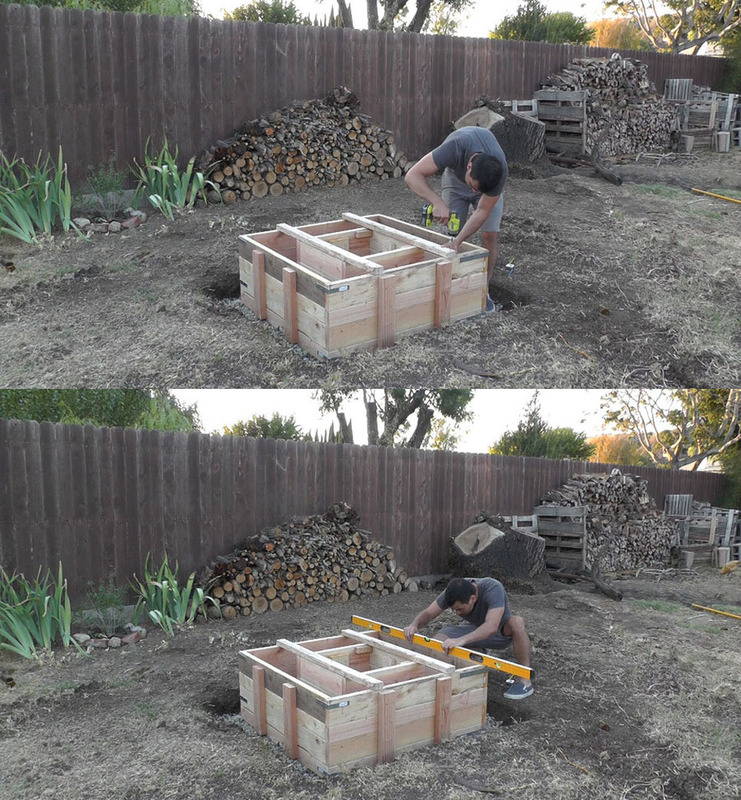 I used a hoe to push the concrete down into all the corners and a wood dowel to vibrate the concrete by hand. Screed the top. 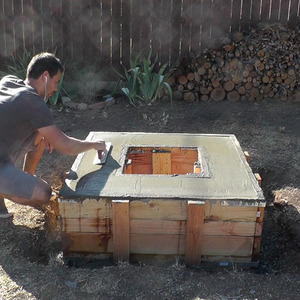 I used a flat piece of wood to screed the top of the concrete. 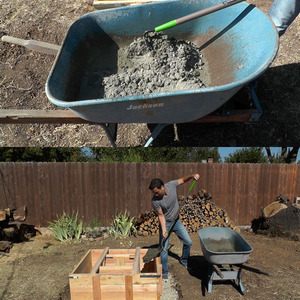 Work the screed back and forth to level the concrete. Use a float. 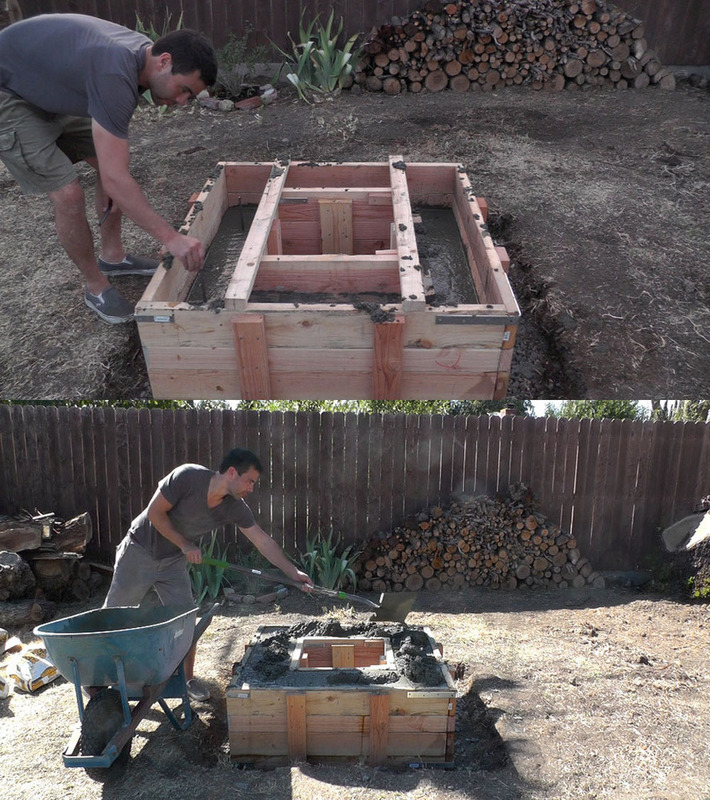 I let the concrete set about 30 minutes and then used a metal float to work the cream to the surface. I spent about 10-15 minutes working the surface. Steel Trowel. 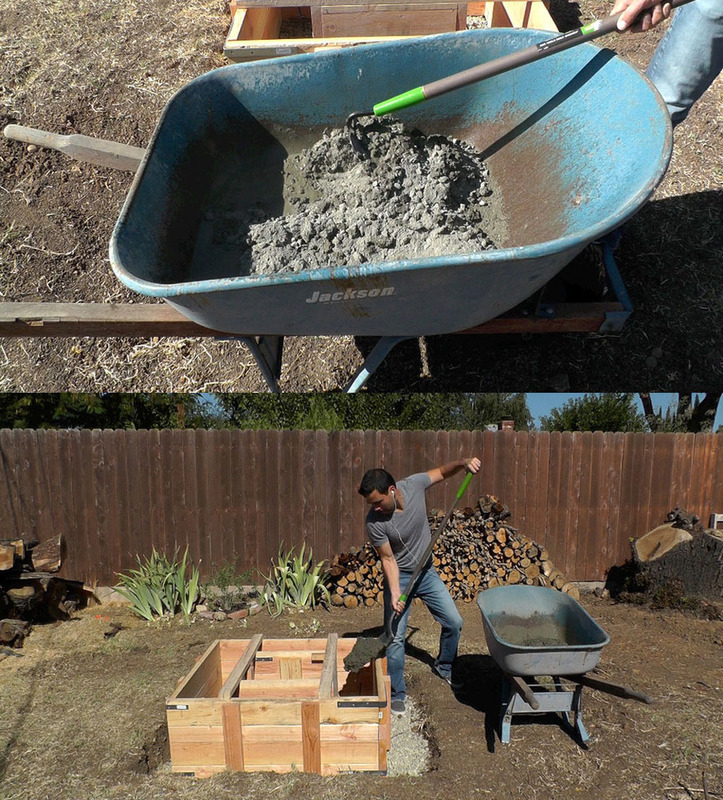 After using the float I waited about 1 hour and then used a steel trowel to finish the concrete. I did my best to get the surface as smooth and flat as possible. It isn’t perfect but it looks great! Cover and keep moist. 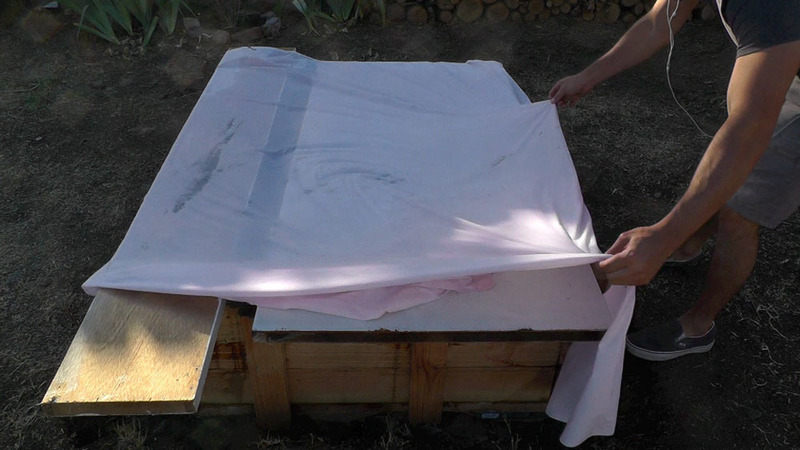 I covered the concrete with some boards and a sheet and made sure that nothing touched the wet concrete. I used a garden hose to keep the concrete moist over a 48 hour period. 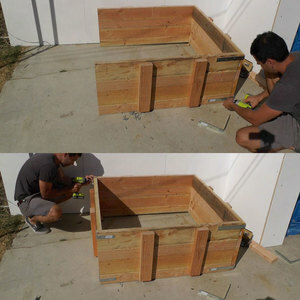 Remove the formwork. Removing the outer frame was easy. 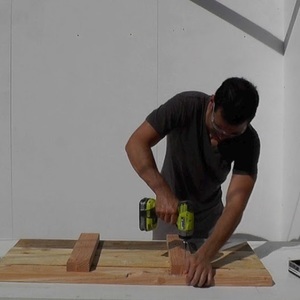 The inner one required some cuts with a circular saw. I should have made some diagonal cuts in the interior panels before hand but not a big deal either way. After about 20 minsutes with a pry bar, hammer and circular saw I got the wood out. Sprayed off the concrete with a hose to clean it. 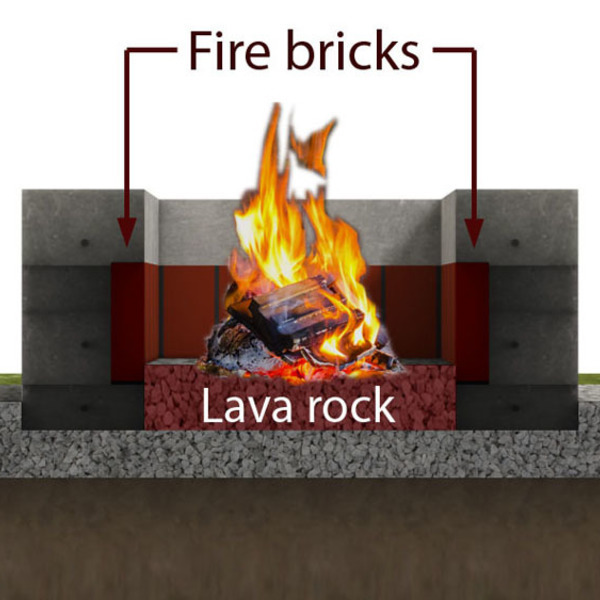 Pour in some lava rock. I poured 2 buckets of lava rockets in the inside of the pit. 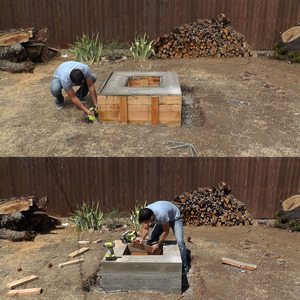 This creates a nice well drained surface for starting fires and covers the 3.5” foundation layer of concrete. Before you light a fire. 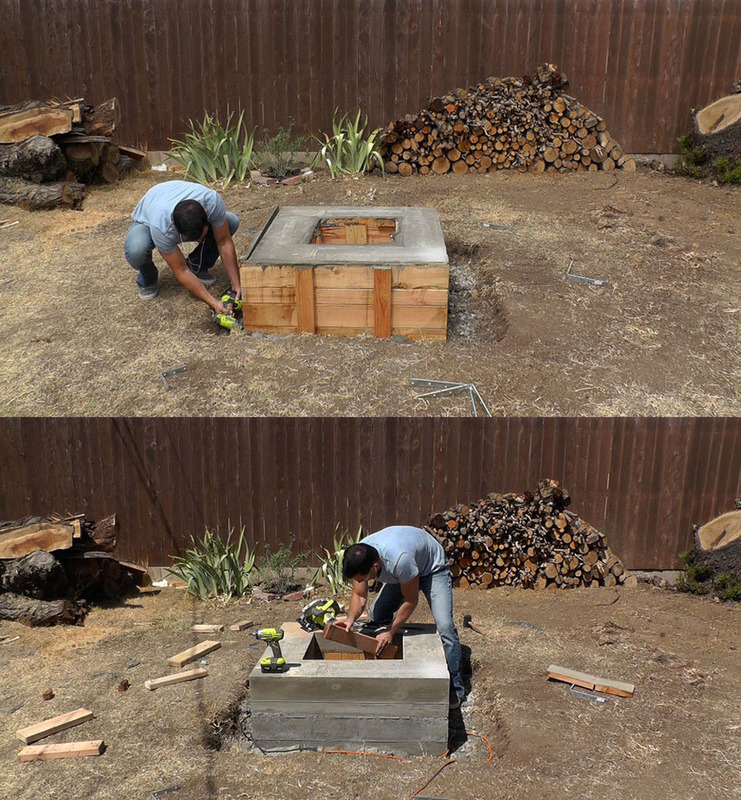 I recommend letting the concrete cure at least 30 days before lighting a fire. And I would recommend not letting a fire burn for longer than 2 hours for the first 3 months. 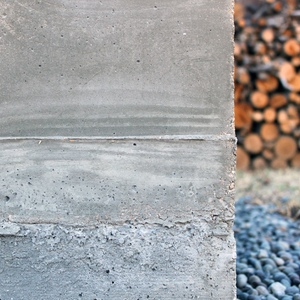 It takes a long time for concrete to fully cure and you don’t want the moisture to expand inside it and cause cracking. Also be responsible and don’t make super large fires. 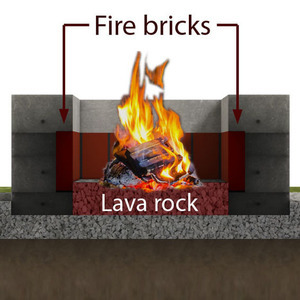 The concrete is protected by the fire brick and lava rock but if you make giant bon fires and let them burn for hours and hours the concrete could crack. 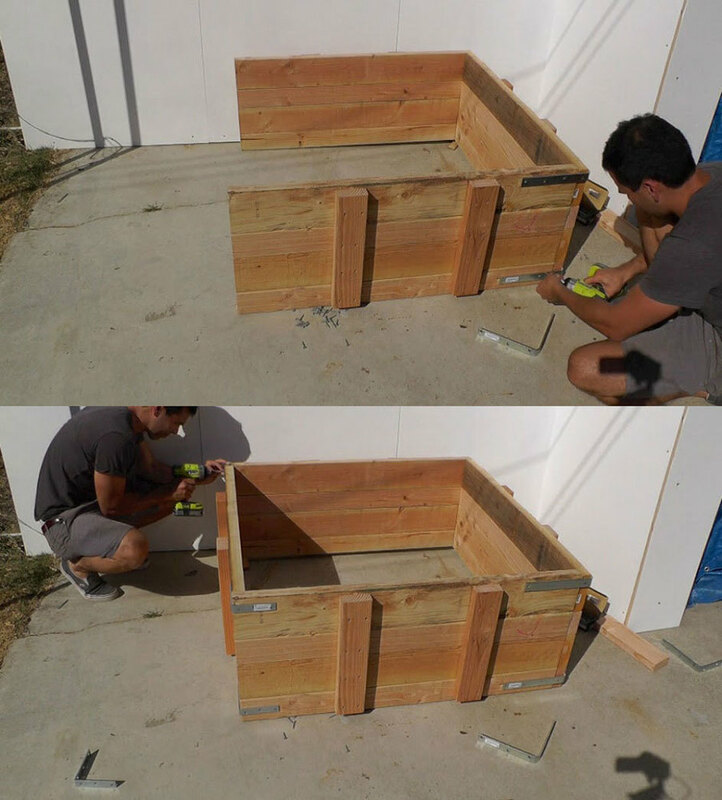 **Exclusive Feature**: Click here to download Homemade Modern's blueprints for this How-To! I am currently in the middle of this project. 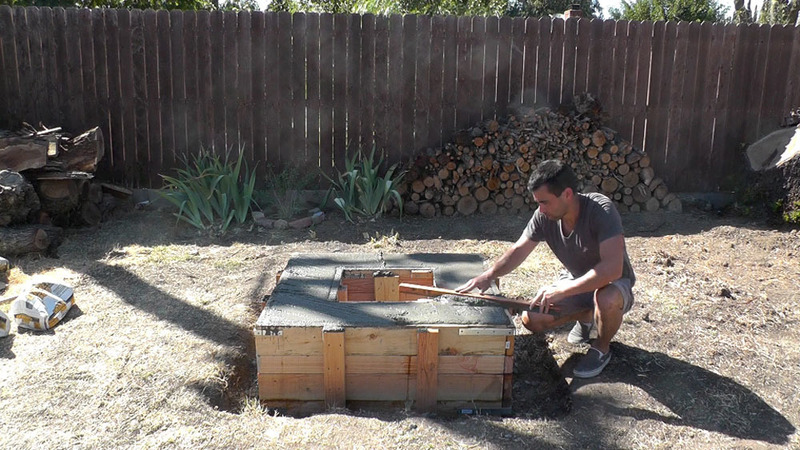 Waiting for the first layer of concrete to dry before I put in the fire brick. This project is very labor intensive. I had NO IDEA what I was in for... oh well no turning back now, and I'm sure it will look great. Thanks Ben! Hi. 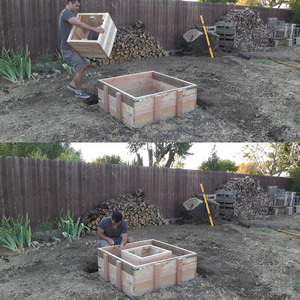 I am planning on doing this project. Any idea on how many bags of cement are needed?